Seriously, now it’s Libya that is shuddering under the mass movement of the citizenry? A regime that survived the reprobation of the international community for the West Berlin disco bombing, the Lockerbie bombing, and a decision to get into the nuclear club (and then out of it), is being brought down by riots triggered by …what? Food? Corruption in the housing market? The smell of freedom? Whatever the reason, the populace is showing remarkable depths of anger, able to overcome brutally repressive tactics from the Gaddafi regime and fight on. 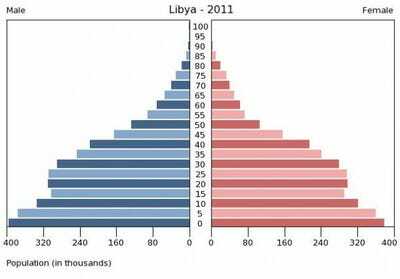 Libya’s population pyramid looks like many others in the restive region. It seems that suddenly, everywhere you look there’s a group of people who are mad as hell, and not going to take it anymore (although I prefer the simplicity of the Nancy Reagan “just say ‘no'” formulation). There are the rioters in Libya (and before them Egypt and Tunisia, and along with them some others). Iceland’s populace has previously just said ‘no’ to paying back the €4bln it borrowed from the UK and Netherlands to compensate savings account holders when Landsbanki imploded several years ago; the legislature approved a new interest rate and schedule of payments, but the President of Iceland will put the new deal back to the people. How do you like the idea that the debtor gets to decide when, how, and even whether to repay a debt? I suppose that’s always true at some level since the debtor always has the option to default but traditionally they at least protest about the purity of their intentions. Four billion Euros is pretty small (especially since the proceeds of the Landsbanki liquidation should cover most of the it), but the repercussions if Ireland just says ‘no’ to the EU by voting a populist line in its referendum on Friday are far more stark. With all of the other geopolitical rumblings, the Ireland referendum might sneak up on some people. But both sides of the European bailout mechanism is being said ‘no’ to. German Chancellor Angela Merkel just saw her party suffer the worst loss in Hamburg since WWII. German voters are saying no to sending money to Ireland, and the people of Ireland are saying no to taking it. Is it just me, or does it sound like the only people who think the EU should continue to bail out failed banks and countries are the elite politicians who can make other people pay for it? However, the global power-to-the-people thing isn’t limited to the proletariat against the bourgeoisie. Sometimes, it’s the proletariat who can make other people pay for their privileges. In Wisconsin, Governor Scott Watson is representing the view of the non-union citizens against the unions, which is leading to demonstrations which would seem impressive if we hadn’t recently seen much better. The latter group is better-organised and wields considerably more political clout; the former group is far more numerous. I am cheesehead, hear me roar! 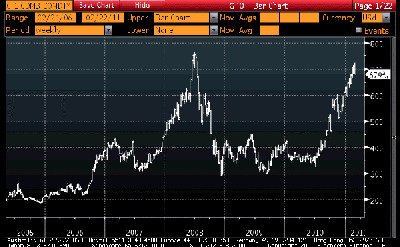 Of these, the issue with the most elemental importance to today’s trading was clearly the Libyan situation. Crude oil prices shot up nearly 8% today (basis WTI, closing the gap with Brent somewhat). The knock-on effect on inflation-linked markets was substantial. Inflation swaps were up 25bps for 1y tenors, 5bps at 5yrs, and 2bps at 10yrs. Notice that the big flattening of the inflation curve clearly illustrates that the expected impact from an oil price spike is short-term in nature. Oil spikes higher, and even if it never comes down it ceases to add to inflation since the latter represents a change in price level. A spike manifests in a higher short-term inflation level but tells you little about what the long-run price level will be. Energy price inflation is mean-reverting to a rate something around the broad price index. The important point is that this move notwithstanding, you haven’t “missed your chance” to get inflation protection. Longer-term inflation protection hasn’t gotten much more expensive, yet. Oddly, while energy did very well the grains and industrial metals both declined. The grains took the worst of it, with Wheat -7%, Beans -5%, and Corn -4%. The excuse seems to be that unrest in the Middle East will decrease demand for foodstuffs from the world’s breadbaskets, but I don’t think I understand that reasoning. It seems to me that if anything, people need to eat more when they’re fighting. An army travels on its stomach, after all. If the government is no longer procuring grain, then surely private entities will need to pick up the slack (or for that matter humanitarian organisations). It isn’t like people will stop eating. Stocks didn’t take well the renewed uncertainty and the perceived growth effect of an oil price spike. The S&P dropped 2%. The growth effect is probably not the main cause; $7 on oil just doesn’t have a very large effect. Now, make it $70 and sustain it for a little while and it’s a different story, but in my mind the risk to equities now is not the chance of $170 oil but rather the chance that this becomes the checkered flag indicating to everyone who has been nervous about the rally that this stage of the race is done. Blending that observation with the somewhat-weak S&P/Case-Shiller Home Price Index data that came out today – home prices are weak, unless you live on a farm. Do you know how well farmland prices are doing? In 2010, the growth in land values was 12% in the Chicago Fed’s district, the second-largest jump in the last 30 years (thanks to BN for pointing this out). But this isn’t all about the recent run-up in the price of crops. Farmland prices should impound not just current prices, but expectations about all future prices as well. Since there would seem to be no reason to expect grains prices to accelerate faster than the overall price index for a lengthy period of time – after all, history tells us it has always worked the other way over a long enough time span – this rise isn’t merely about good prices for soybeans. It is significantly about the fact that farmland is now considered an investible asset class by pension funds hungry for real returns. 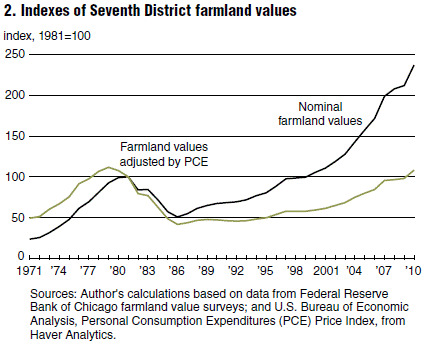 While other real estate prices have been diving for the last few years, nominal farmland values have been lifting off. I’ve clipped the chart below from the Chicago Fed article linked to above. Source: Chicago Fed. This doesn’t look like the residential real estate chart! Farmland isn’t like commodity futures. Pension funds cannot meaningfully affect the spot price of commodities by buying commodity futures unless they take delivery and so affect the final demand for the product (and they are quite loathe to do so). They can affect the degree of backwardation, to be sure, but not the spot price. But farmland and other real property that is directly owned for investment can see prices affected by investment demand. There’s no one to go short the farm and provide the bid later when the pension fund wants to unwind the contract. When a pension fund (or an investment vehicle funded by pension funds) buys farmland, it reduces the float of available farmland and drives up the price – much more akin to what happens in, say, the art market than what happens in commodities. If everyone is bidding on the Van Gogh, it isn’t the futures price of Starry Night that rises but its spot price. Same with farmland, and it creates the same opportunity for bust if investors pay too much to get in. This is not, however, a 2011 or even I suspect a next-5-years concern. Right now, it’s merely comic relief next to real, current global crises. I don’t want to predict that today’s selloff in stocks is the beginning of a deeper setback. Investors have shown an eagerness to leap back into the fray at every opportunity since Bernanke first mused about QE2, and this may happen again. But if the uneasiness I feel is more widespread, then there may be more to come as investors “just say no” to stocks. That may not mean that they “just say yes” to bonds. Although today’s rally to 3.47% on the 10y note effectively puts an end to the threat of higher rates in the near-term, long rates are likely to be supported in the 3.33%-3.40% range. The alternative may well be cash, and zero-yielding money funds, for now, and if that is the case it could also affect the money supply numbers. 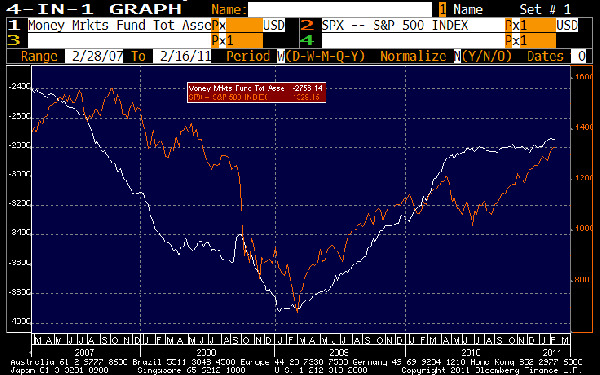 Money fund assets – a component of M2, by the way – have been on a steady decline since peaking right around the time the stock market bottomed. The chart below shows the S&P 500 (in red) against money fund assets reported by ICI (inverted and shown on the left scale). A significant correction in stocks, especially with long rates providing little buffer against inflation, could easily flow back into safe and low-yielding money funds and other components of M2. Wouldn’t that be interesting? What if the money supply were to begin to surge at the same time that oil prices were spiking and stocks were declining? How would the Fed respond to that? “Just saying no” isn’t an option!